Every little girl who has long hair will want to wear a ponytail at some point in her life. Little girl ponytail hairstyles are a wonderful way to ensure that a girl looks and feels her best. These fun hairstyles are perfect for any little girl, depending on how much hair she has and how willing she is to sit still for the hairstyle to be completed. One of the most popular ponytail styles that most little girl will wear at some point in her life is a sleek and back top to a side pony. These ponies can be placed at the back of the head, as well, but tend to have more movement and provide more personality when they are worn on the side of the head. The slick top prevents flyaways from getting in her eyes. Pull through braids are a wonderful way to update a regular pony, as it isn’t traditional. These chunky braids are anything but boring and are a great way to make it look like a girl has more hair than she really does. They are also a wonderful way to hold back excess hair and prevent it from escaping, as there are multiple elastics used in the creation of this style. The half up half down is a classic style that is really great for putting a pony on a girl who doesn’t have enough hair for a full hairstyle. These can easily be accentuated by large bows or colorful elastics, which make them even more fun and allow the girl to showcase her personality. When done correctly, these show off the face and keep the girl from dealing with hair in her eyes. Girls who have a lot of hair often struggle to contain it when they wear it in a pony, which is why this is such a popular option. By simply banding the length of the pony with elastics, it’s much easier to keep the hair in place and prevent it from escaping. Use a variety of different color bands to really make this little girl ponytail hairstyle pop, or go with one color for a monochrome look. When a younger girl has a lot of hair and wants to show off the body and movement that it has, then a free and loose pony is a great option. This style helps keep the hair away from the face and prevents it from becoming a mess, but allows it to move freely with the girl. This style can easily handle a large bow as an accent. 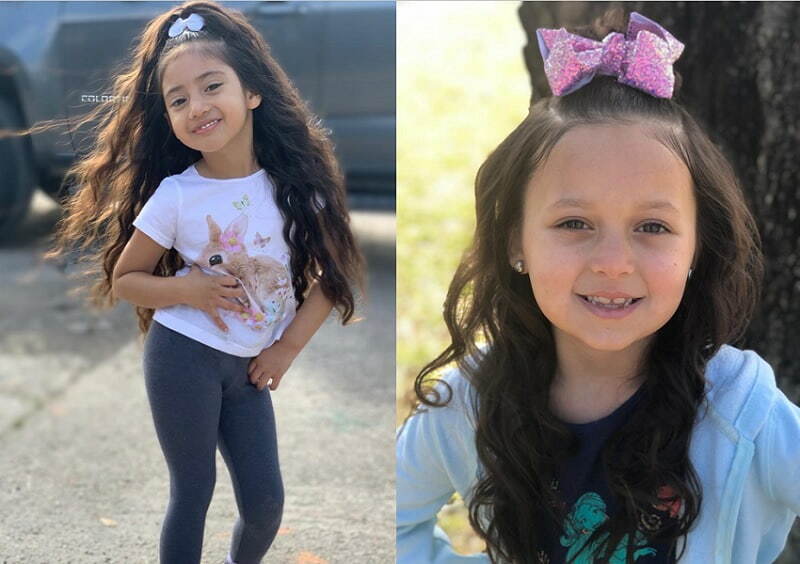 While not the most popular of all ponytail hairstyles for little girls, this pony is quickly becoming more popular as girls realize how easy it is to dress up their pony and match the ribbon in their hair to the rest of their outfit. This fun style involves a twisted pony that has a lot more visual interest than a regular pony, as well as wrapping it with ribbon to add color. Braids don’t have to be left hanging down around the face, and generally, look great when they are pulled up and into a pony. A side pony has a lot more personality than one on the back of the head and is a wonderful way to keep these cornrow braids from coming loose. 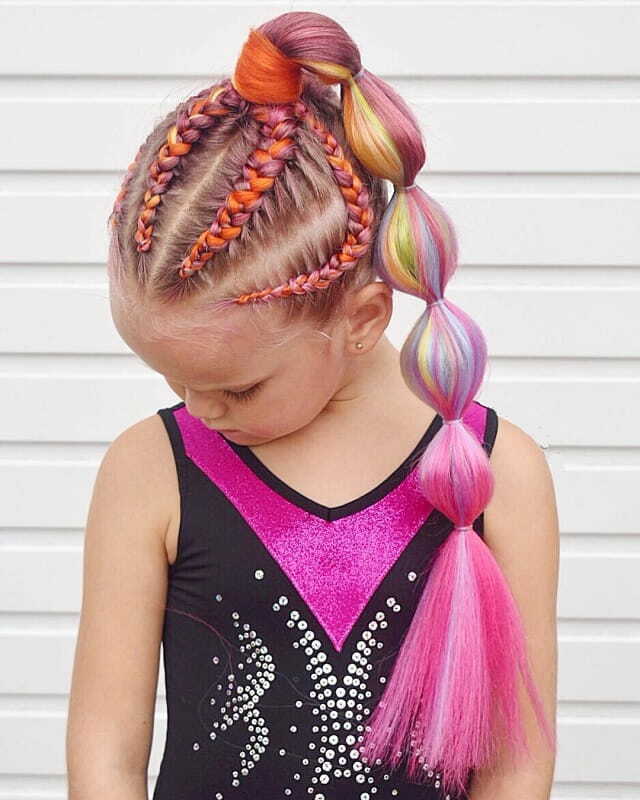 Fun elastics or baubles in the hair help to accent this braided pony hairstyle with beads for little girls and make it unique. It’s becoming more and more common for ponies to involve elaborate braiding techniques that really set them apart from other hairstyles in the past. This elaborate braid is made even more impressive with a huge bow or a bunch of cloth flowers, which serve to really make the design pop. The bright colors of the bow or flowers are a great accent against the darker hair. Rubber bands don’t just prevent flyaways, but they also are a great way to add interest to an otherwise regular pony. This little girl’s pony has blue bands down its length and rests against some more hair, which helps to make the style pop. With more blue bands on the side of the head, as well as a blue bow in the hair, it’s a well thought out design that doesn’t take too long. There’s no reason why a ponytail on little girl’s hair has to be boring, as evidenced by these ponies springing from hearts on the back of the head. Braiding and twisting the hair into a heart before pulling it into a pony adds a lot of interest to this design. The large bow is attractive and does a great job at hiding any imperfections in the style, making it a really forgiving choice. One fast way to make a regular pony seem much more impressive is to create a lot of small braids and then pull them back into the pony. This adds interest to the little girl ponytail style and is also a great way to ensure that shorter pieces of hair, such as the bangs, don’t fly free. This slick look is formal and great for school, as well as for church. Busy mornings call for fast and easy hairstyles, and there are few styles easier than this pony. The hair can be pulled straight back into the pony or put into a French braid first, and then the hair of the pony itself is quickly braided. It’s a great way to keep hair out of the way and to add some interest to an otherwise boring style. Side ponies are a fresh take on regular ponies on the back of the head, and this side pony is made even more interesting thanks to the addition of a few small braids, as well as a big bow. The braids come across the top of the head and make this little girl ponytail hairstyle a bit more special. An elaborate thick braid is a refreshing take on an old favorite and is perfect for when parents have a little more time in the morning to do hair. This braid has a weave that mimics a basket, which does take a little more time to create, but is really impressive when it is finished. With an attractive bow at the back of the neck, the rest of the pony is allowed to hang free. One braided heart into a pony is a popular hairstyle among little girls, but this pony takes it up a notch with the inclusion of three hearts made from hair. It’s perfect to wear on Valentine’s Day or to a special party or event. By using a bow that is made from heart fabric, parents can really make the hearts on the back of the head pop, which is sure to make this pony stand out from any others. There’s no reason why a little girl has to wear a pony on its own, especially when it can look so stunning when paired with a top knot. A top knot is a great way to catch any shorter pieces of hair that may not easily stay in the pony and is sure to add interest to the style. With matching embellishments on the bubble pony and the top knot, this is an eye-catching ponytail hairdo for little girls. It’s easy to combine the fun and freedom of a side pony with the whimsy of a heart hairstyle. These hearts look like they are flowing from the side of the head and that they are captured in the bright pink flower, which then leads into the pony. Leave the hair in the pony down, as adding braids to the pony will only serve to detract from the rest of the hairstyle and make it more difficult to distinguish the hearts. Reverse french braid up the back of the head is a wonderful way to get the hair prepared for a really high pony. 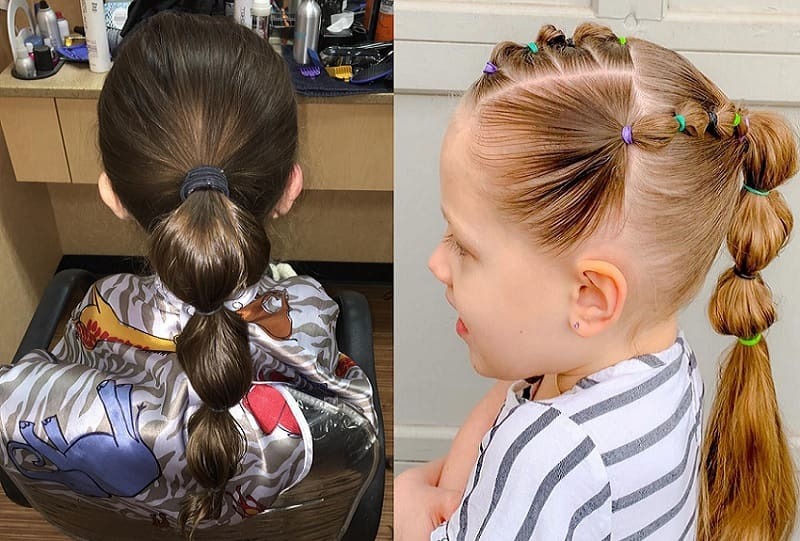 These ponies swing free and have a lot of bounce, but girls who want to draw more attention to their hair will want to consider adding bright colors to the braid and to the pony. Blues and pinks are sure to make the ponytail hairstyle with little girls hair really pop and will attract the attention of anyone nearby. A small French braid on the top of the head can then be pulled into a back pony that is anything but boring. By wrapping fabric or string around the top part of the pony, it’s easy to make this little girl’s ponytail style stand out from the head and to make it have much more body and volume, which is great for girls with fine hair. The bright orange string and flowers really pop thanks to the orange dip on the end of the hair. Any girl dressing up and wearing a unicorn horn on her head needs to enjoy a full pony that will make them feel like the real deal. This little girl’s pony is left loose for motion, but is thick and full, which keeps it from falling limp. Girls with thick hair can easily wear this style pony, but even girls with thinner hair can enjoy the style, as long as some thickening products are used. There’s something really fun about a side pony on little black girls who have curly hair can enjoy a full and attractive pony that is a fun addition to their style. By cornrow braiding all of the hair on one side of the head and then pulling the braids to the other side, this full style is easily achieved. It looks great when there are lots of small curls that are allowed to bounce free and give the hair some movement. Girls who love a lot of colors and who don’t shy away from being the center of attention are sure to love this vibrant pony. Multiple French braids are pulled into a pony, which is then secured down the length with elastics to give it more body. The bright rainbow colors of the pony make it pop and prevent the girl wearing it from blending into any crowd. Sometimes little girls want to wear a ponytail style that is a little understated, and that’s when this is a great option. The low pony is pulled to the back of the head and only has half of the hair, which allows the rest to fall gently around the shoulders. The pony itself can be accented with a real flower, which will make the whole hairstyle look very natural and relaxed, perfect for an afternoon walk or for seeing friends at a playdate. A French braid that runs along the back of the head looks a lot like a crown, and by adding additional braids and then ending the little girl’s hairstyle in a side pony, this can be a great style for a fancy event. All of the braids do take a little effort, but they are a wonderful way to keep hair from having flyaways and also to provide a little body and movement to the style when pulled into the pony. A slick ponytail style for little girls that is sleek and modern looks great, especially when it is styled in the shape of a letter. This is a really fun way to celebrate the letter of the day at school or to allow a girl to wear the first letter of her name on the back of her head. The letter “C” is really easy to do, but even more advanced letters can be formed and shaped into a pony with a little effort and some elastics. Any of these fun little girl ponytail styles are a great option to consider the next time you need to do a little girl’s hair. Consider these great ponytail hairstyles for kids and you are sure to keep your little girl cool, comfortable, and confident.